QuickSilver® high performance dump truck liners are designed to clean-out and clean-up of some of the toughest materials including hot asphalt in the very worst conditions. From winter freeze to summer heat, QuickSilver® truck liners release sticky materials, meaning faster load release, less equipment damage, reduced chance of tip-over, less wear on hoists, minimal clean-up and reduced downtime. On-road, off-road or heavy equipment, we've got a QuickSilver® liner for you. or topsoil in a dump truck lined with QuickSilver® on-road. DURAPRO dump body liners can be installed in dump trailers, dump bodies, bottom dumps, gravel trains and transfer dumps with both floor and wall packages. 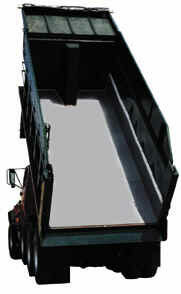 Available in kits, DURAPRO™ dump body liners can be self- or professionally installed.